Bloodborne pathogens : $35.00 per person in class or $19.95 online. 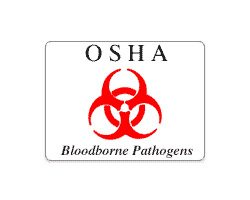 Our bloodborne pathogen training program is ideal for conformity to OSHA regulations and bloodborne pathogens training requirements. We offer traditional or completely online options. The online option is 100% Florida accredited for Nursing, Health Department, Tattoo and Piercing and Dental Boards. Bloodborne pathogens present a serious and invisible threat. It is almost impossible to recognize by looking at a person whether or not they are infected with a bloodborne pathogen. It is absolutely necessary to train your employees on safe work practices. Help protect the safety and health of your employees with our bloodborne pathogen training class. We have also combined our HIV/AIDS program into our bloodborne pathogens class. In addition to the bloodborne pathogen training, you will receive training and information to help you become aware of HIV transmission and prevention. Our program helps maintain a supportive and productive work environment for everyone and helps businesses meet the need for reliable and factual information about HIV and AIDS, how to stop the transmission of HIV, encourages people to respond in informed ways to people who have HIV, and helps people apply the facts about HIV to their own behavior. Online Option: See the link below to take the class totally online. This is 2 hours with online test depending which class you take. Traditional Classroom Option: Please email us so we can hold a bloodborne training at the end of any regularly scheduled class or at a time that fits your schedule (or we can travel to your own office, school, business or tattoo shop for a fee). If you need a regular bloodborne pathogens traditional classroom course, email us at info@cprflorida.net and we can usually do it AFTER a regularly scheduled cpr and first aid class or do a private course.